백자 달항아리는 높이에 비해 몸통이 약간 벌어져 보이는 둥근 구형이지만, 입지름에 비해 굽 지름이 80% 정도 작지만 전체적인 비례는 단정하고 안정적이다. 입과 굽의 높이도 서로 적당하여 잘 어울리며, 몸통의 접합부가 비교적 완전하여 부분적인 쳐짐이나 비틀림도 거의 없다. 유태(釉胎)는 비교적 안정적이며 유약의 두께는 얇지만 태토에 완전하게 융착(融着)되어 있고 맑은 황갈색을 아주 엷게 띠는 투명유(透明釉)이다. 입술부분(口緣部) 일부를 수리하였지만, 전체적인 보존 상태가 매우 양호하다. 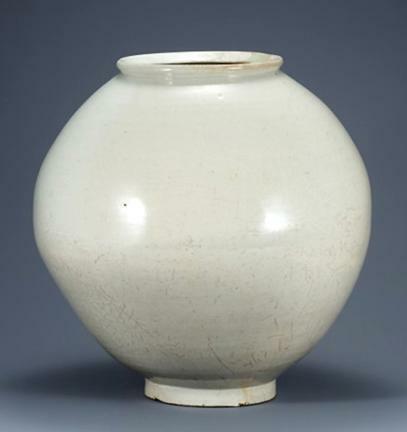 This large white porcelain moon jar is not perfectly round in shape, as its body is slightly wider in the middle compared to its height. The diameter of the foot is about 80% of the diameter of the mouth, but the overall form is well-balanced and stable. The height of the mouth and foot are also proportionate to each other. There is no visible trace of the seam in the middle where the upper and lower parts were joined, and there is hardly any warping or distortion in the overall form. A clear, transparent glaze with just a slight tint of yellowish brown is applied in a very thin layer, which is tightly fused to the clay body. This white porcelain moon jar is preserved in good condition, showing slight signs of minor repairs to the mouth.